This is a different and interesting take on the Arthurian legends. It begins in our world, with Kyah feeling like a misfit and starting to see strange things. 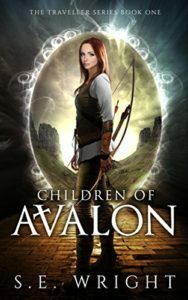 It turns out she’s a Traveler and able to travel through portals to different worlds, one of which is Avalon, a realm of fantasy where the legends of earth are real. Her new sidekick who teaches her the ways of the new world she’s found herself in is Naieem, a tiny fairy princess. Her first mission in this new life is to save King Arthur. I enjoyed the twists on old legends and the people who make them up. Kyah has to learn to live in a different world and learn new skills not found on modern earth where she grew up, such as using a sword and becoming an archer. She is appropriately confused at her new circumstances but quickly finds her place among new friends. Her quest to find out who—and what—she is begins in this book. I’m looking forward to discovering how this unfolds in the subsequent stories.